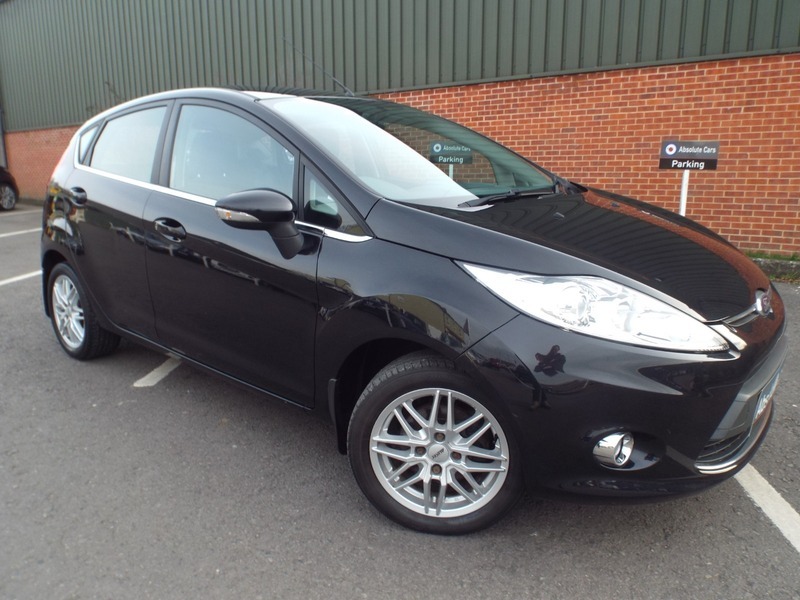 ABSOLUTE CARS have this lovely 1.25 Ford Fiesta Zetec in metallic black with alloys, call in for a test drive, finance arranged & part exchange considered. AS WE ARE AN AA CARS DEALER THIS VEHICLE COMES WITH A FULL AA HISTORY CHECK AND 12 MONTHS AA BREAKDOWN COVER. WE ARE OPEN MONDAY TO FRIDAY 9.00AM TO 5.30PM SATURDAY 9.00AM TO 5.00PM, Upgrades - Blu. Hands-Free Tech./Vo. Con./USB Port, 3 months warranty, Next MOT due 03/08/2019, Last serviced on 17/01/2019 at 44,720 miles, Service history, Grey Cloth interior, Standard Features - 15in Alloy Wheels (195/50 Tyres) with Locking Wheel Nuts, 60/40 Split Folding Back and Fixed Cushion, Accessory Power Socket (12V), Anti-Lock Brakes, Emergency Brake Assist (EBA), Body Coloured Bumpers, Body Coloured Rear Spoiler, Centre Console, Centre High - Mounted Rear Brake Light, Centre Rear Seat Belt, Drivers Airbag, Drivers Knee Airbag, Electric Power Assisted Steering (EPAS), Electrically - Operated Front Windows with One - Touch Lowering/Closing on Drivers Side, Electrically - Operated/Heated Door Mirrors with Integrated Side Indicators, Electronic Brake - Force Distribution (EBD), Electronic Stability Programme (ESP), Four Front Speakers, Front Fog Lights with Chrome Bezel Rings, Front Side Airbag (Head and Thorax), Front and Rear Head Restraints, ISOFIX Mounting Brackets for Child Seat (Rear Outer Seats Only), Immobiliser, Leather Gear Knob, Leather Trimmed 3 - Spoke Steering Wheel, Manual 4 - Way Driver Seat Adjust, Manual Air-Conditioning, Passengers Airbag, QuickClear Heated Windscreen, Radio/CAS MD, MP3 Compatible, Multifunctional 2 - Line Display, AUX Connection, Rake and Reach Adjustable Steering Column, Remote Audio Controls, Remote Central Locking with Two Keys, Seat Buckle Pre-Tensioners on Front Seat Belts, Traction Assist, Trip Computer, Two Cup Holders, Tyre Mobility Kit, Upholstery Cloth. 5 seats, Metallic Black.AS WE ARE AN AA CARS DEALER THIS VEHICLE COMES WITH A FULL AA HISTORY CHECK AND 12 MONTHS AA BREAKDOWN COVER. WE ARE OPEN MONDAY TO FRIDAY 9.00AM TO 5.30PM SATURDAY 9.00AM TO 5.00PM.